Four LR 1300 Liebherr crawler cranes are currently building the new Santa Clara Stadium, future home of the San Francisco 49ers. 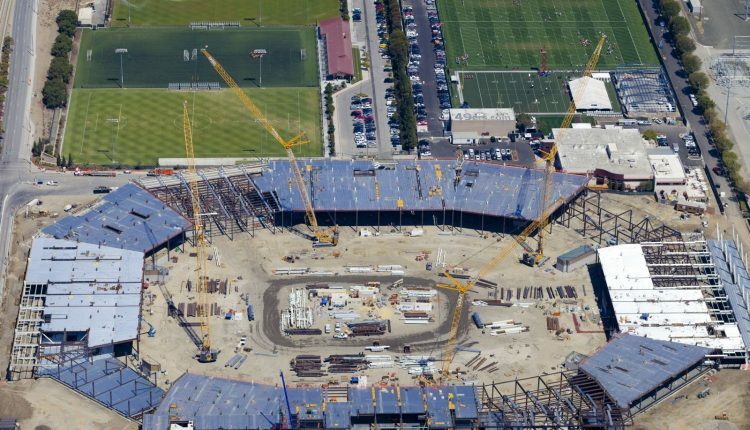 The stadium is a joint venture project between Turner Construction and Devcon Construction and will be completed in time for opening day fo the 2014 NLF season. To erect the steel structure, the LR 1300 crawler cranes were provided by Bigge Crane and Rigging Co. All four crawler cranes are fitted with a main boom of 154 ft. and a luffing jib of 164 ft. Altogether, they are erecting no less than 14,000 pieces of steel with a total weight of more than 35,000 tons. The LR 1300 meets the requirements of this construction site, as it is able to hoist 30,000 lbs. of steel beams at a radius of up to 205 ft.
All four Liebherr cranes were delivered and rigged in the same configuration within the same week. They will be operating simultaneously and continuously on the jobsite for approximately five months. The cranes are working in two-shift operation in order to complete the framing. Therefore, each of the four cranes is lifting 50 steel sections per day. In the first construction phase more than 3,000 piles were drilled, 30 miles of utilities, cable, and pipes were laid underground, and approximately 10,000 cu-yd of concrete were poured by 400 workers. By mid September, about 15 percent of the stadium has been finished. The $1.2 billion stadium will hold a total of 68,500 spectators and will cover 1.85 million sq-ft. It is designed to be a multi-purpose facility, hosting a wide range of events such as domestic and international soccer, college football, motocross, concerts, and various civic events.